Our research focuses on responsive, functional soft and hybrid materials. These include: (i) macromolecular brush materials, such as polymer brushes on flat substrates, polymer brush-grafted particles (hairy particles), and molecular bottlebrushes, (ii) stimuli-responsive polymers, which can undergo large conformational changes in response to external stimuli, and (iii) liquid crystalline polymers for application as electrocaloric materials. In general, we use “living”/controlled polymerization techniques (atom transfer radical polymerization, nitroxide-mediated polymerization, reversible addition-fragmentation chain transfer polymerization, ring-opening polymerization, ring-opening metathesis polymerization, etc.) in conjunction with conventional organic synthesis and click chemistry to synthesize the designed polymers and hybrid materials. More information can be found on our research page. Dr. Zhao received his B.S. and M.S. degrees in polymer chemistry from the University of Science and Technology of China in 1992 and 1995, and his Ph.D. degree in polymer science from the University of Akron in 2000. 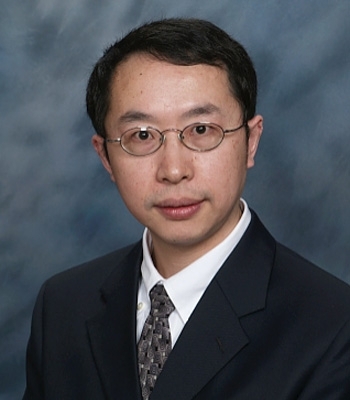 After completing his postdoctoral research in Beckman Institute at the University of Illinois at Urbana-Champaign, Dr. Zhao joined the faculty of the University of Tennessee in 2002. Fu, W. X.; Zhao, B. “Thermoreversible Physically Crosslinked Hydrogels from UCTS-Type Thermosensitive ABA Linear Triblock Copolymers”, Polym. Chem. 2016, 7, 6980-6991. He, L. L.; Hu, B.; Henn, D. M.; Zhao, B. “Influence of Cleavage of Photosensitive Group on Thermally Induced Micellization and Gelation of a Doubly Responsive Diblock Copolymer in Aqueous Solutions: A SANS Study”, Polymer 2016, 105, 25-34. Luo, C. H.; Fu, W. X.; Li, Z. B.; Zhao, B. “Multi-Responsive Polymethacrylamide Homopolymers Derived from Tertiary Amine-Modified L-Alanine”, Polymer 2016, 101, 319-327. Wright, R. A. E.; Henn, D. M.; Zhao, B. “Thermally Reversible Physically Crosslinked Hybrid Network Hydrogels Formed by Thermosensitive Hairy NPs”, J. Phys. Chem. B 2016, 120, 8036-8045. Hu, B.; Fu, W. X.; Zhao, B. “Enhancing Gelation of Thermosensitive Hydrophilic ABC Linear Triblock Copolymers in Water by Thermoresponsive Hairy Nanoparticles”, Macromolecules 2016, 49, 5502-5513. Li, J.; Hu, B.; Yang, K.; Zhao, B.; Moore, J. S. “Effect of Polymer Grafting Density on Mechanophore Activation at Hereointerfaces” ACS Macro Letters 2016, 5, 819-822. Wright, R. A. E.; Wang, K. W.; Qu, J.; Zhao, B. “Oil-Soluble Polymer Brush-Grafted Nanoparticles as Effective Lubricant Additives for Friction and Wear Reduction” Angew. Chem. Int. Ed. 2016, 55, 8656-8660. Chen, C. Y.; Zhang, T. C.; Zhu, L.; Zhao, B.; Tang, P.; Qiu, F. “Hierarchical Superstructures Assembled by Binary Hairy Nanoparticles” ACS Macro Letters 2016, 5, 718-723. Fox, T. L.; Tang, S. D.; Zhang, G.; Horton, J. M.; Zhao, B.; Zhu, L.; Stewart, P. L. “Loading and Delivery Characteristics of Binary Mixed Polymer Brush-Grafted Silica Nanoparticles”, Macromol. Chem. and Phys. 2016, 217, 1767-1776. Tang, S. D.; Horton, J. M.; Zhao, B.; Zhu, L. “Self-Organization of Homopolymer Brush- and Mixed Homopolymer Brush-Grafted Silica Nanoparticles in Block Copolymers and Polymer Blends” Polymer 2016, 90, 9-17. Hu, B.; Wright, R. A. E.; Jiang, S. S.; Henn, D. M.; Zhao, B. "Hybrid Micellar Network Hydrogels of Thermosensitive ABA Triblock Copolymer and Polymer Brush-Grafted Nanoparticles: Effect of LCST Transition of Polymer Brushes on Gel Property" Polymer, 2016, 82, 206-216.